You don’t have to be a professional athlete to reap the benefits of a sports massage. Sports enthusiasts of any level can benefit from massage therapy. Additionally, if you work in a profession that requires repetitive or aggressive movements of lifting, pushing, pulling, and carrying, then adding sports massage to your regularly scheduled chiropractic adjustments can benefit you in both the long and short term. Receiving a sports massage for 60 minutes, once a week, or every other week has shown to improve your overall sense of well being. Massage rejuvenates your mind, body, and spirit. Designed to reach deep portions of muscle fibers and release toxins, this type of touch increases the body’s recovery rate. We can help you reduce injuries and soreness related to over-excursion. At Barkley Massage & Chiropractic, we’re excited to help you feel at the top of your game. A sports massage therapist can leave you feeling energized and optimistic for weeks. Because we care about your health and busy lifestyle, we even offer massage and chiropractic packages as well as easy online appointment scheduling. 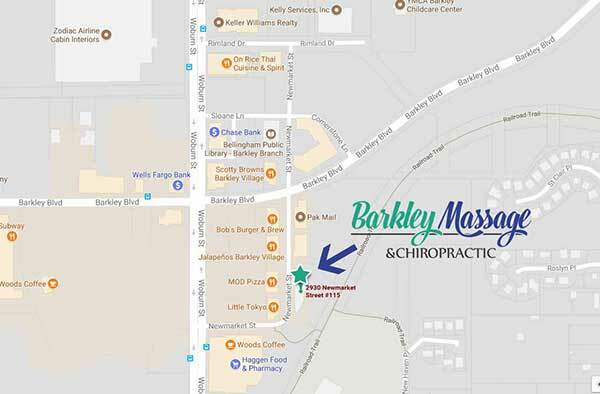 Schedule your sports massage today at Barkley Massage & Chiropractic in Bellingham. Conveniently located next to Starbucks in Barkley Village, with ample free parking, we’re open seven days a week. 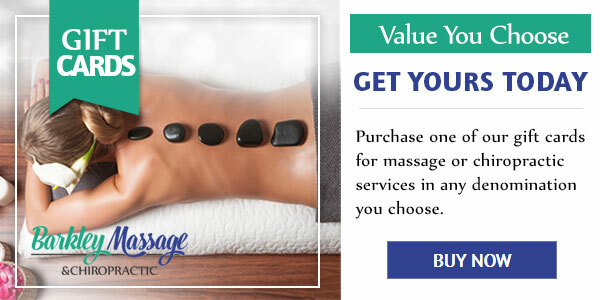 You can count on us for all your massage therapy needs. Call us to find out more about our affordable membership packages, online gift cards, and other ongoing deals.